Mugzie® brand To Go Cups combine the excellent insulation and water-proof properties of neoprene wetsuit material and the usefulness of a spill-proof, stainless steel travel mug. The Mugzie’s unique, hand-sewn fabric cover is made from 1/4” closed-cell neoprene and is covered with soft, water-proof polyester fabric. The stain-resistant cover is printed in hi-resolution and has full-wrap coverage. 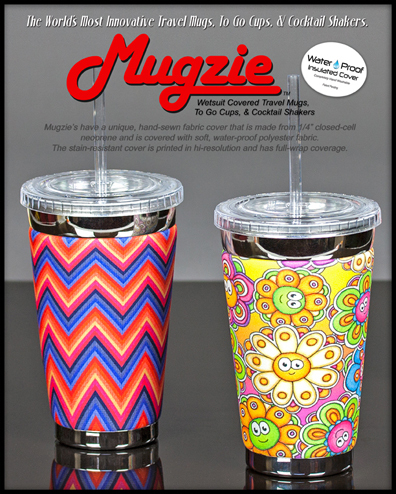 The Mugzie® To Go Cups have excellent insulating properties to keep beverages hot or cold. The cushioned cover affords a secure grip and eliminates condensation and sweating. Mugzie® To Go Cups fit in most car cup holders and the counter-weighted, non-slip, bottom provides stability. Use it for both hot and cold beverages. 16 Ounce Capacity. Features a spill-proof removable lid and and a non-skid bottom. Decorated, sewn, and assembled in the U.S.A. Patented. Please use the navigation to the left to find your favorite Mugzie To Go Cup.